After reading Gov. 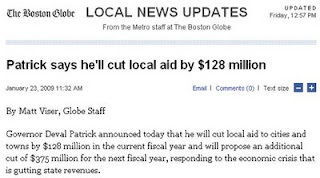 Patrick's speech yesterday at the Massachusetts Municipal Association I learned that the proposed 9.7% cut will be applied to the "Lottery aid" and "Additional Assistance" line items in the FY09 Cherry Sheets. For Longmeadow the FY09 total of these line items is: $1.51 million .... so it looks like the financial hit will be $146,000. This is only my guess and not an official number. It is possible that Gov. Patrick may elect to apply some other formula to decide how to distribute these cuts particular given the fact that the city of Boston has such a high amount of “additional assistance” in their cherry sheet allocation. A straight application of the 9.7% cut translates to $22 million cut for the city of Boston of which $16 million comes from the “additional assistance” line item. For Longmeadow it looks like the underperformance of investment income and excise tax receipts (-$200,000) as FY09 revenue sources + higher than budgeted snow removal costs (-$25,000) that were discussed at this week's SB meeting (reported in an earlier post) will be larger items. At this point total budget cuts required for FY09 may total ~ $371,000. Looking forward to FY2010 Governor Patrick said that he will be proposing a level funding of Chapter 70 funds for education and a significant cut in “Lottery aid” and “additional assistance” funding with the net result of a total state aid reduction for cities and towns of 7.1%. For Longmeadow this FY2010 budget reduction would amount to ~$480,000. It looks like the upcoming FY2010 budget process will be very difficult. On Wednesday, January 28 the official FY09 budget cuts for each town will be announced. Hopefully, it will be equal to or less than the $146,000 estimate. Today, Governor Deval Patrick has announced cuts of state aid to cities and towns will total “only” $128 million as compared to earlier estimates as high as $500 million. See full article on Boston.com. Gov. Patrick also announced that the $128 million in cuts would not affect the state aid to cities and towns for public education but did not indicate how these latest cuts would be allocated town-by-town across the state. With the new information and applying them equally based upon original state aid allocations ($128M/$5.3B = 2.4%), our "guess" for reduced state aid for Longmeadow is ~ $205,000. Add this number to the $200K shortfall in other town revenue highlighted during the Select Board meeting earlier this week, the town will likely need to cut ~ $400K in expenses for the FY2009 budget year. It will be interesting to see how the Town Manager/ Select Board and School Committee address this revenue shortfall. .. and not much good news! Finance Director, Paul Pasterczyk stated that there likely will be a FY09 revenue shortfall of ~ $200K originating from lower investment income (-$107K) and lower excise tax receipts (-$90K). Both of these areas will likely impact FY10 budget revenue as well. Mr. Pasterczyk updated the SB regarding snow removal costs and stated that the current expenditures were $25K over budget and likely to increase as the winter progresses. Town Manager, Robin Crosbie updated the SB regarding FY09 budget actions and said that she has asked all town departments to develop budget reduction contingency plans but at this point has not requested specific “appropriation turnbacks” or expenditure reductions. In addition, purchase orders over $500.00 are being carefully scrutinized before she approves them in an effort to curtail unnecessary spending. Ms. Crosbie indicated that a large portion of current expenditures are directed at maintenance and repair items to keep the various departments operational. Bobby Barkett asked if the oversight could be extended to purchase orders > $100…. Ms. Crosbie said that she would followup with each town department. Ms. Crosbie stated that the fiscal problems currently being addressed by Gov. Patrick that will be impacting Longmeadow and other towns will likely require a detailed review of prioritized town services to determine which ones will be impacted- both in the current FY09 and FY10 budgets. Ms. Crosbie highlighted that it is possible that the cuts in state aid may not be applied equally across all towns and cities and that a per capita income adjustment or similar factor may be applied… which doesn’t bode well for Longmeadow’s share of the cuts. Ms. Crosbie wants to maintain current headcount in order to retain key experience and knowledge within town departments. Furthermore, there is no excess in current staffing to provide required municipal services. Clerical staffing is being rotated from department to department when needed to complete specific projects. However, she acknowledged that salaries are a very large factor within the overall town government budget and that large reductions in expenditures will be difficult to achieve without staffing reductions. In an effort to curtail FY09 expenses, two open job town government vacancies will not be filled. Overall, not much good news from last night’s meeting. In fact, it looks like there will be an additional shortfall of ~ $200K in town revenue that will need to be compensated in addition to what the state announces late next week. The SB seemed resigned to wait until the "financial tsnami" hits Longmeadow at the end of next week and will take up discussion of what to do next at their regular meeting on February 2. Stay tuned to the LongmeadowBuzz blog for additional updates.